I should admit up front that I was initially uncomfortable writing the article. It meant visiting the soup kitchen and interacting with an image in my mind of grizzled vagrants who might even be dangerous. The reality of that experience was polar opposite. While there may have been one or two “grizzled vagrants,” what I found more than anything were people just like me who were doing the best they could just to get by. But more than anything, what I found was a community of love, understanding and support. It was truly special and like nothing I’d ever seen before. On that Fall day in 2014, I was greeted by the meal coordinator, Linda Curtis. In her 70s, Mrs. Curtis was like a mother hen to the guests she served each week. She was cautious about talking to me at first, wanting to make sure the story I wrote didn’t paint a negative image of her guests and reinforce society’s image of the homeless and needy. But, after a lengthy vetting of my intentions, Mrs. Curtis began to open up about her mission and the community she served. And, after further vetting, she allowed me to meet meet her guests. I’ll never forget my first impressions as I walked into the dining hall of the “Saturday Noon Meals.” My first thought was that it was like nothing I’d ever expected or seen before. In my mind, I’d seen a cafeteria-like serving line where downtrodden people with heads dipped low in defeat accepted paper plates with mystery meat, wilted salad and stale rolls. What I found instead was a community of people—both volunteers and guests—who had a true connection and affinity for each other, all sharing a nutritious meal prepared with love. Let me paint for you a picture of what I saw that day. In the center of each table was a small flower arrangement donated by a local grocery store florist, and a spread of pre-dinner appetizers were displayed on large banquet-sized tables for guests to partake before the meal was served. Mrs. Curtis was a blur of activity as she directed volunteers and prepared the meal, but she stopped repeatedly to greet guests by name and with a smile. At one point, a gentleman walked in with a bushel of fresh vegetables he’d picked up at the locals farmers’ market on his way to dinner. He presented those vegetables to Mrs. Curtis as his contribution to her efforts. I learned later that this gentleman had been a regular guest for nearly ten years; at first living in his vehicle but, now experiencing better circumstances, he seldom attended dinner empty-handed—he frequently brought “gifts” to Mrs. Curtis or other guests as he noticed an interest he could fulfill. As the clock ticked down to noon, Mrs. Curtis called the room to attention where she gave announcements of interest to those in attendance. I think most surprising to me at that moment was how many people she knew by name, and how many people she mentioned. One person was having a birthday, the other had recently been offered a new job, and yet another person had some other exciting news she shared with the group. At the end of her announcements, she asked those assembled to allow her to say a prayer—and then she mentioned even more people in the pre-dinner prayer. It was like she knew and cared about nearly every person in the room. At the end of announcements and the prayer, a flurry of volunteers entered from the kitchen with rolling carts filled with food. They stopped at each table where they placed serving bowls piled high, after which each guest served himself and then passed the bowls family-style around the table. And throughout the meal, conversation was abundant. These people really cared about each other. As I sat there and interacted with Mrs. Curtis’ guests, there was no “us” or “them.” There was no poverty or social status. There were just people gathered together to share a meal. And all of this was made possible by the love extended from one woman toward everyone there. While there I met so many people—people that could’ve been you or me. I met a mom and daughter who used this one week as their opportunity to have mother-daughter time. I met a family who, while not homeless, were only one step away from living out of their car. I met friends who’d known each other for years, and people who’d only just met. And each person interacted with complete warmth and acceptance. When I left the Saturday Noon Meals that afternoon, I left a changed person. My perception of homeless and hungry had changed. The people were no longer the vagrants of my imagination; they had faces. They had lives and stories and struggles…all of which I could relate to. No, I’ve never been poor or in jeopardy of losing my home, but the circumstances that led to many of their situations were relatable. Just a single domino falls, and the whole line goes down, one block after another. For weeks after my visit, I couldn’t get their stories out of my head. Most especially, I couldn’t get the few children in attendance out of my head. What must it be like to “need” the services of a free weekly meal? What must it be like to be a high school student—when we all already know that the caste system in a middle or high school is nothing short of completely brutal, especially for those who are “different” in any way. As the days passed and my article was published, my mind kept returning to the people I met that day. I called my mother-in-law to share this experience, and the experience affected her as well. She began sending new blankets, hats, etc., to be given to the guests at Saturday Noon Meals. I’ll never forget on one of my return visits, my arms laden with a couple of large boxes of new blankets and hats, Mrs. Curtis had instructed me to take a father and son to the storage room and allow them to take their pick. The son was about eight and couldn’t decide between two hats. Well, it’s cold and it’s Minnesota. I’d brought a lot of hats, and this was a kid! I said, half joking but completely serious, “Take them both—they’re small.” The boy looked at his father, who shook his head. And that, my friends, is the statement that has lived with me since and which finally forced me to sit down and write ROAM. You see, while there are a lot of reasons for poverty, not everyone is looking for a free handout. While there are certainly some who will take advantage of any system, it’s important to remember that there are equally as many who are just experiencing hard times and are truly looking for nothing more than a hand up which they’ll return in kind to another when their own circumstances improve. Sadly, Mrs. Curtis passed away this past June. While she knew I’d written this story, and she knew I’d found an agent to sell it, I never had a chance to tell her that this manuscript had found a publisher. I was waiting to surprise her with an image of the finished cover. But when I emailed her, she didn’t respond. And when I called to inquire about her—because it was unusual for her to ignore an email—I learned of her passing quite literally only a few days earlier. It saddens me that Mrs. Curtis never had a chance to read the book she and her work inspired, but I hope she lives on through the memories of those who knew her, the work that is continued in her name, and by the pages of this novel. 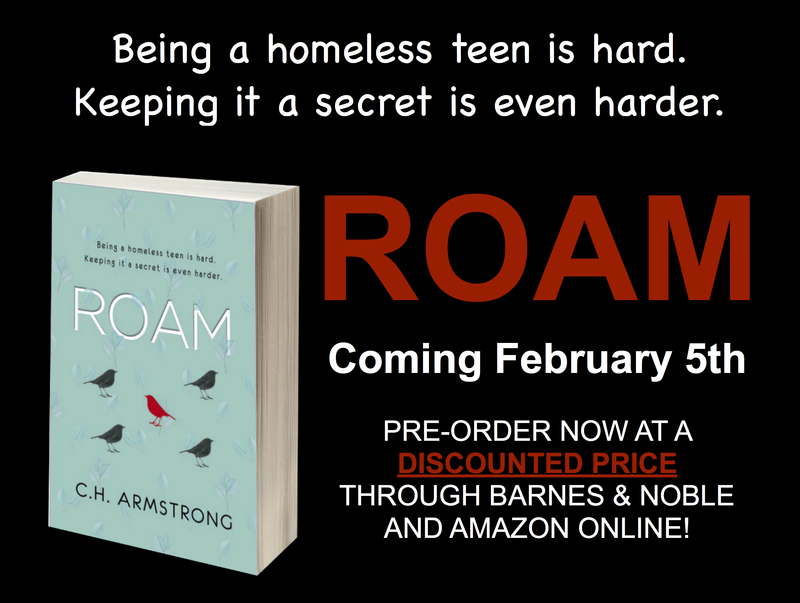 ROAM releases in just 22 days on February 5th. Watch this space for a free first chapter teaser coming soon. In the meantime, if you’d like to read that article I wrote so long ago for Rochester Women magazine, use this link.